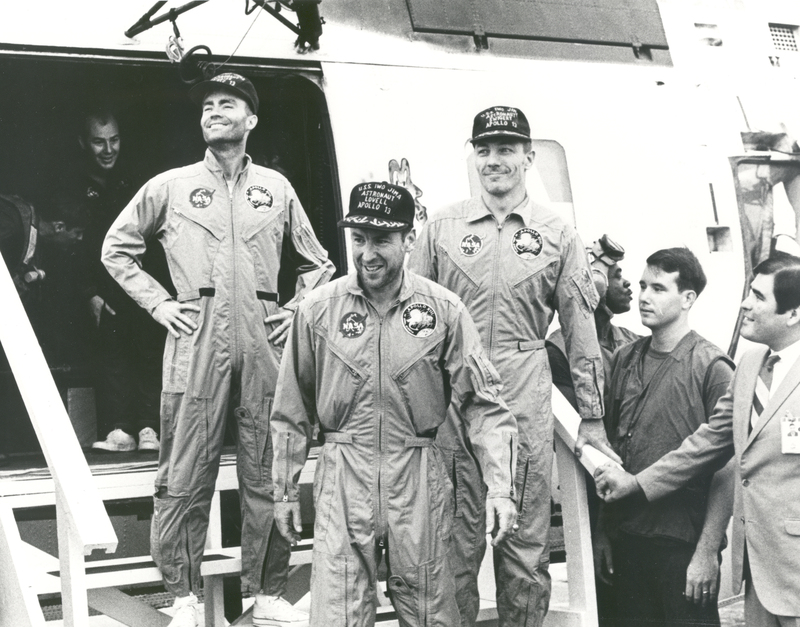 Why Didn't the Apollo 13 Astronauts Just Put On Their Space Suits to Keep Warm? Contrary to popular belief, space isn’t actually “cold” per se, at least not in the way often depicted in movies. Space is just mostly empty and all that nothing doesn’t have a temperature. For example, if you were in space without a space suit, the two ways you’d lose heat are just via evaporation of moisture on your skin, in your mouth, etc, and then much slower via radiating heat away, which would take a really long time. In fact, if you were in direct sunlight at around the Earth’s orbit distance from the Sun (1 AU), you’d find yourself overheating pretty quickly, likely with severe sunburns within a few minutes. This all brings us to the topic of today- if space isn’t cold, why did the astronauts on Apollo 13 get so cold in their ship? And when things did get chilly, why didn’t they just put on their space suits to warm up? To begin with, somewhat counterintuitively, the reason their ship got so cold so fast is precisely because it’s troublesome to get rid of heat on a space craft. With all the equipment on aboard the ship generating heat, as well as extra heat absorbed when the ship is in direct sunlight, this would normally see the astronauts baking inside the craft. To get around the problem, the ships were specifically designed to radiate heat away very quickly to compensate. Just in case this cooling happened too quickly, for instance when not in direct sunlight helping to heat things up, the ship was also equipped with heaters to keep the astronauts comfortable. Thus, during the Apollo 13 mission when all the equipment was off and they couldn’t spare power to run the heaters, they were left with a ship designed to radiate heat away relatively quickly, even when in sunlight, but nothing but their own bodies and sunlight generating heat. The net effect was that it got really cold inside the command module and LM. This brings up the logical follow up question- when it got cold, why didn’t they just use their space suits to keep warm? In search of a definitive answer, we discovered a variety of speculative explanations online, many of which get surprisingly technical and ultra specific, despite that nobody was using a definitive source and were simply speculating. Further, nowhere in any Apollo 13 transcripts we read does the idea of the astronauts in question donning their space suits to keep warm ever have appeared to have been suggested or brought up, despite the cold. Unsatisfied with going with speculative explanations, we eventually resorted to mailing a letter to Fred Haise to get a more definitive answer, with, unfortunately no response. Eventually it dawned on me that somehow we all had to get some sleep, and we tried to work out a watch system. We weren’t very successful. Besides the inside of the Odyssey kept getting colder and colder. It eventually got down pretty close to freezing point, and it was just impossible to sleep in there. Fred and I even put on our heavy lunar boots. Jack didn’t have any, so he put on extra long johns. When you were moving around the cold wasn’t so bad, but when you were sitting still it was unbearable. So the three of us spent more and more of our time together in Aquarius, which was designed to be flown by two men- standing up, at that. There wasn’t really sleeping space for two men there, let alone three, so we just huddled in there, trying to keep warm and doze off by turns. We didn’t get any sleep in the true sense of the word. We considered putting on our heavy space suits, but the suits were so builky that they would compromise our maneuverability in an emergency situation, and when you put on the suit you were bound to perspire a lot. Soon you would be all wet and cold too, an invitation to pneumonia. It’s also noteworthy here that in a separate interview, NASA engineer and man in charge of the spacecraft warning system during Apollo 13, Jerry Woodfill, stated that nobody on the ground was terribly concerned about the astronauts being cold or getting hypothermia. With what they were wearing and the temperature inside the spacecraft, they were cold, but not critically so, and everyone had much bigger problems to deal with. You see, as you might have already gleaned from the previous passage by Lovell, it turns out the otherwise phenomenal Apollo 13 film took some liberties and it was not, in fact, ever cold enough to do something like tap frozen hot dogs against the wall. In fact, according to that same LIFE magazine article, Jack Swigert stated, “Aquarius was a nice, warm 50 degrees.” He further went on to state that “It was 38 degrees in [the Odyssey] before reentry.” To translate for the rest of the world, that means it was about 10 degrees Celsius in Aquarius and about 3.8 degrees Celsius in the Odyssey. Cold, particularly in the Odyssey, but with what they were wearing, not unbearably so for two of the three crew members, especially when spending as much time as possible in the Aquarius. I’ve been a lot colder before but I’ve never been so cold for so long… The last 12 hours before renentry were particularly bone chilling. During this period, I had to go up into the command module. It took me four hours back in the LM before I stopped shivering… Because of the cold, during the last two nights I slept in the tunnel between the two vehicles with my head in the LM and with the string of my sleeping bag wound around the latch handle of the LM hatch so that I wouldn’t float around. Speaking of space suits and Hollywood myths, in movies you’ll often see humans exposed to the near vacuum of space doing things like suddenly exploding, instantly freezing in the supposedly extreme “cold” of space, etc. But, in fact, so long as you don’t try to hold your breath, which would result in your lungs rupturing and thus pretty well guaranteed that the incident will be fatal, what will actually happen is you’ll remain conscious for about 10-15 seconds. After that, you’ll be fine as long as you’re placed back in a pressurized environment within about 90 seconds. It’s even possible that some might be able to survive as much as 3 minutes, as chimpanzees are capable of this in such an environment without lasting detrimental effect. For significantly more detail on all this and how we know these numbers, check out our video How Long Can You Survive in Space Without a Space Suit? Wikipedia’s article on outer space (https://en.wikipedia.org/wiki/Outer_space) says it is cold (3-5 Kelvin).